Are you interested in writing a series of novels, picture books or stories? Here are some series tips. My first general tip is to use Scrivener. It’s the software designed for authors and writers. It allows you to arrange (and rearrange) chunks of story, much like an outline. There’s a visual aspect when you use the cards view. And it lets you keep research or reference files on anything you like. The binder area where files are listed has three basic divisions: Story, Other Files and Trash. Of course, you should rename these as you wish. You can import a webpage or photos, or just store text to which you’ll need to refer. Here’s the binder for my science fiction trilogy, The Blue Planets Series. Book 1, Sleepers is now available in stores. Scrivener’s Binder puts files into one of three basic areas: Story, Other Files, or Trash. You can rename these as you wish. Here, the base folders are expanded so you can see files. Notice that there are 3 titles in the Blue Planets, along with OLD versions and Outtakes. The three books in this trilogy are SLEEPERS, SIRENS and PILGRIMS. I also have files for OLD version, outtakes, and possible short stories within the series. The RESEARCH folder is full of important info that I don’t want to research over and over. Instead, I plop it into a file in Scrivener and I can easily find it when needed. For characters, you’ll see a couple files with character names. That’s where I put everything I can about the character’s background, how they look physically, family relationships. etc. I find the hardest thing to remember is sometimes the simple things like John has blue eyes. Character growth is important to track. Your main characters should change somehow in each book; and over the series, there should be an overarching change. If they start out selfish, they should learn to think about others needs first. That sort of thing. I track these changes and key plot events that provoke the changes across individual novels and across the series. New characters present a problem, as well, As the series moves locales, I need to create new characters. When I was working on Book 2, for example, I not only added characters, but I also had to keep track of old ones because characters will refer back to them. That’s why I love having all three books in this one file. The search function allows me to easily find the information from previous stories; at the same time, if there’s a reference file on that person, it’ll pop up, too. Continuity is so much easier in Scrivener. A trilogy is just one big story that spans a longer period of time. This story covers about a year. This is the card view in Scrivener. Here, I can jot down dates and track the timeline of the story. For each chapter or scene, I jot down the date, and time if needed. Everything must fall in the right sequence (or be deliberately out of sequence), or the story falls apart. This also helps me notice the time of year and create appropriate details. Book 2, SIRENS occurs in late December to early January. That means I must include Christmas decorations, parties, etc. And then, a New Year’s Eve gala. It’s cold, especially in Edinburgh, Scotland where most of the events take place. The timeline grounds me in time and space. Scrivener’s Binder lets me use color to track plot. For plotting, I love the ability to color-code files. The pink is the “love story plot” and I used other colors for other plot lines. I’ve always had trouble with subplots, especially, because it was hard to track the subplots across the whole story. As I tell students: It’s easy to write a chapter; it’s much harder to write a novel because you must track everything across a vast number of words. Color coding makes it easier for me. Writing this science fiction trilogy has been much easier than previous attempts because I’ve organized it in Scrivener. A close look would reveal that it’s still a pretty messy organization. That’s why the Search function is my best friend. Here’s my best tip on writing series: devise a way to track the characters, plot, and timeline across the story. You can choose to do it with paper files somehow, but for me, Scrivener works best. 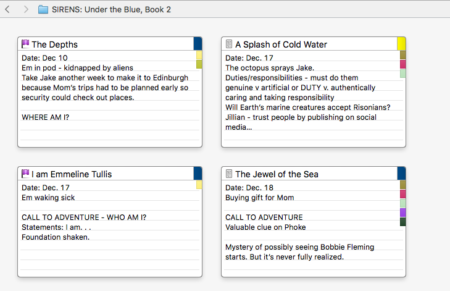 I use Scrivener also for writing, though I do the early brainstorming and planning stuff in composition books lately. This is a very useful post to see how other writers manage this.